Zachary Kinkade Limited Edition Canvas:"Noah's Ark"
Size (H x W): 12" x 18" and 18" x 27"
Edition: 75/150 numbered and hand signed by the artist. COA included. 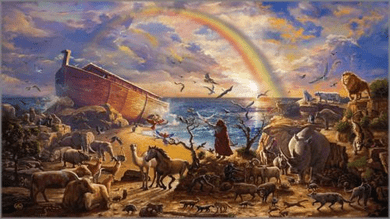 About the Art: There are few Bible stories more familiar than that of Noah's Ark. It is first taught to children in Sunday school as a tale highlighting the importance of obedience to God and of His promise to provide a means to wash away sin without washing away the sinner. The account gives foundation to the new covenant and the story of Jesus and Calvary. In an attempt to capture that narrative as an artist, I wanted to give prominence to the rainbow of God as an act of the Divine as opposed to a by-product of rain and light. To that purpose, I painted the rainbow extending beyond what is possible and into what can be done by the hand of the Creator. I enjoyed selecting the animals and wanted to represent the flood as a world event so I tried to find some balance between the animals of each continent, from the African lion to the North American elk. I also wanted all life represented:from reptile to bird to mammal, both domestic and wild. In that regard, I hope you enjoy exploring my menagerie.